The remarks came after a US Pacific Fleet spokesperson said in late September that a Chinese destroyer had allegedly approached the USS Decatur in an "unsafe and unprofessional maneuver", which prompted the US warship to maneuver so as to prevent a collision. 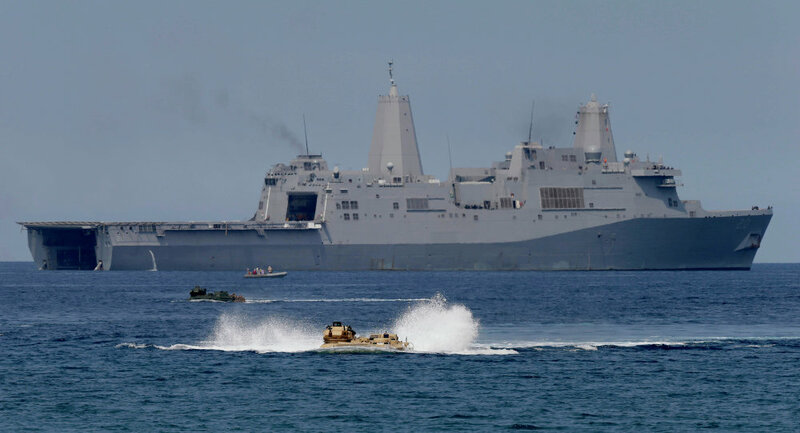 Chief of US naval operations Admiral John Richardson has stated that a recent dangerous sail-by of a Chinese destroyer near an American warship in the South China Sea would not stop the US Navy from patrolling the area. "We will continue to progress this program of freedom of navigation operations. We do dozens of these operations around the world to indicate our position for […] illegitimate claims, maritime claims," Richardson underscored. Chinese Foreign Minister Wang Yi responded by referring to some "non-regional countries" which he said fuel tensions by "showing off their force" in the disputed waters. "We shall work together to be vigilant against and prevent interferences and disruptions coming from the outside as China and the Philippines and other littoral states of the South China Sea are cooperating to uphold peace and cooperation," he pointed out. In a nod to bilateral telephone communication hotlines approved by the Chinese and Philippine coast guards, Wang noted that "mechanisms of this kind can effectively avoid misjudgment and prevent unexpected incidents" in the disputed areas. He signaled Beijing's readiness to create such mechanisms "with other claimant states so as to enhance communication and timely handle the emergencies should they happen." In late September, the US Pacific Fleet slammed what it described as an "unsafe and unprofessional maneuver" of a Chinese destroyer which came close to the US Decatur near Gaven Reef in the South China Sea and finally forced the US warship to maneuver in order to prevent a collision. The Spratly Islands and Paracel Islands in the South China Sea remain the most frequently disputed territories claimed by China, Taiwan, Vietnam, Malaysia and the Philippines. The US has repeatedly expressed concern about China's construction of industrial outposts and military facilities on artificial islands in the South China Sea, where US Navy ships conduct "freedom of navigation" operations. In response, the Chinese Foreign Ministry urged Washington to stop such "provocative" actions, which Beijing said pose a "threat to its sovereignty."